We are, without a doubt, in the era of the highlight and contour. I was so adamant that I did not highlight and yet here I am doing a post about the stuff... ahhh. There is, however, nothing better than catching that light on your cheekbone and getting that all round youthful glow. I have been using the MAC Mineralize Skin Finish Natural in combination with my Lancome Teint Idole Ultra 24H for over 3 years. Through all the additions and name changes; Deep Dark to Dark Deep to Dark Deepest (Really mac?) It just works for me! The baked powder just gives me a natural matte finish with a subtle glow.- I always have two, with one staying in my bag for touch ups throughout the day. I have wanted to try out some other Skinfinish powders for quite a while now, I picked up this Skinfinish in Gold Deposit during a trip to the States. I wanted to get Soft and Gentle but changed my mind and picked this up instead as it was much more suited to my skin tone. It is simply beautiful! Just look at the specks of Gold... I instantly knew that this would give the perfect summer glow! Am I the only one who never wants to use new makeup as it will mess up the perfectness... no just me then! 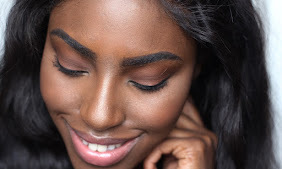 I think this shade looks particularly incredible on those with Medium to Deeper skin tones but it can most definitely be flattering on everyone! *Warning -Be careful! A little goes a long way! Dust any excess powder of your brush before applying. You can also spray your brush with a little Fix + or water for a smoother application and appearance. When I first applied this I literally looked like I had been attacked by the glitter fairy! Do not make the same mistake as me and apply it with a heavy hand! What do you think? Do you own any other MAC Mineralize Skinfinishes? Which one is your favourite? These will suit any skin tone! Soft and Gentle however, looks amazing on fair skin and Gold Deposit looks amazing on deeper skin tones! Thanks Barbara...! I was scared to try it but It's soooo beautiful! My comment system is awful :'(( I need to migrate to Wordpress I think!